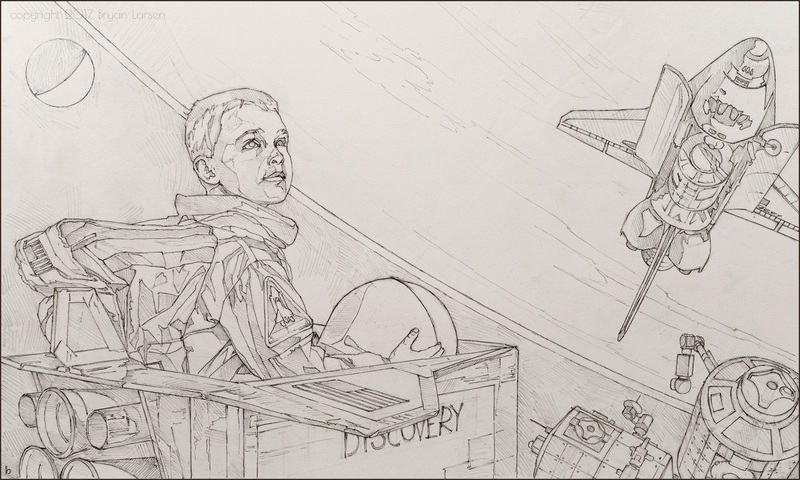 So you’ve just finished work on an awesome drawing in preparation for what should be an equally awesome oil painting. All your proportions, the most important details, the perspective…it’s all worked out. Sweet! But hey, now what? How do you get all that awesome planning and perfect layout work off of a sheet of paper and onto your lovely canvas or panel? An oil transfer, of course! An oil transfer, you ask? What in the world is that? Well, I’ll tell you. Most of you are probably familiar with the charcoal transfer. You smear charcoal on the back of your drawing, then trace over it. Same thing… but using oil paint instead of charcoal. I know what you’re thinking, because I thought the same thing. That’ll never work! What a mess! But it does work. Beautifully. As well or better than a charcoal transfer, and it has a couple of huge advantages. For one thing, once that oil transfer dries, its permanent. No need to secure it with fixatives or trace over it with India ink. For another, it’s oil paint! 100% archival in every way. No bleeding through, no weird chemical interactions years later. We start off with a drawing. Obviously. 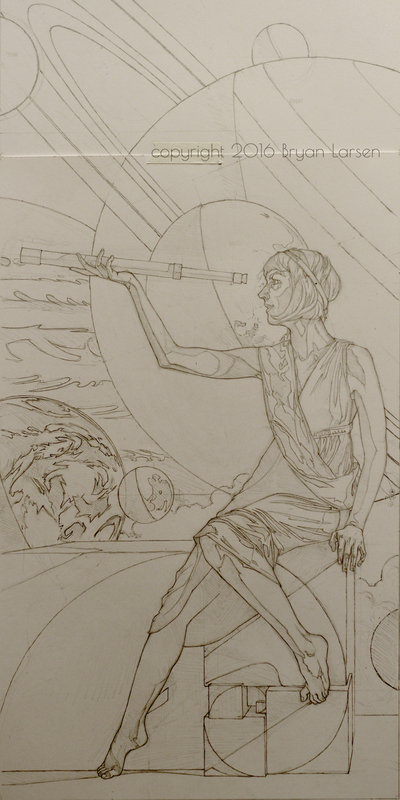 This one was for a painting titled ‘Themis-Urania’, and measured 36 x 72 in, as drawn. 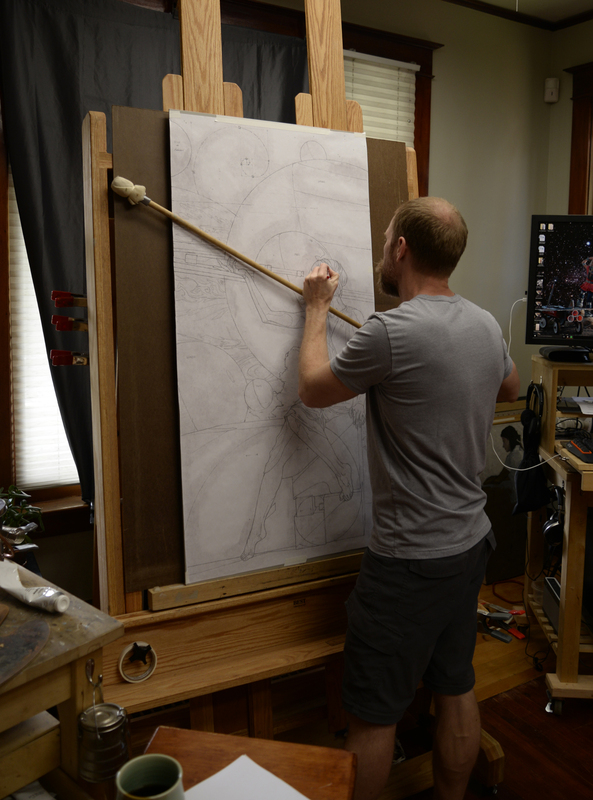 The next step is to blow the drawing up to the size of the canvas or panel it will be painted on. 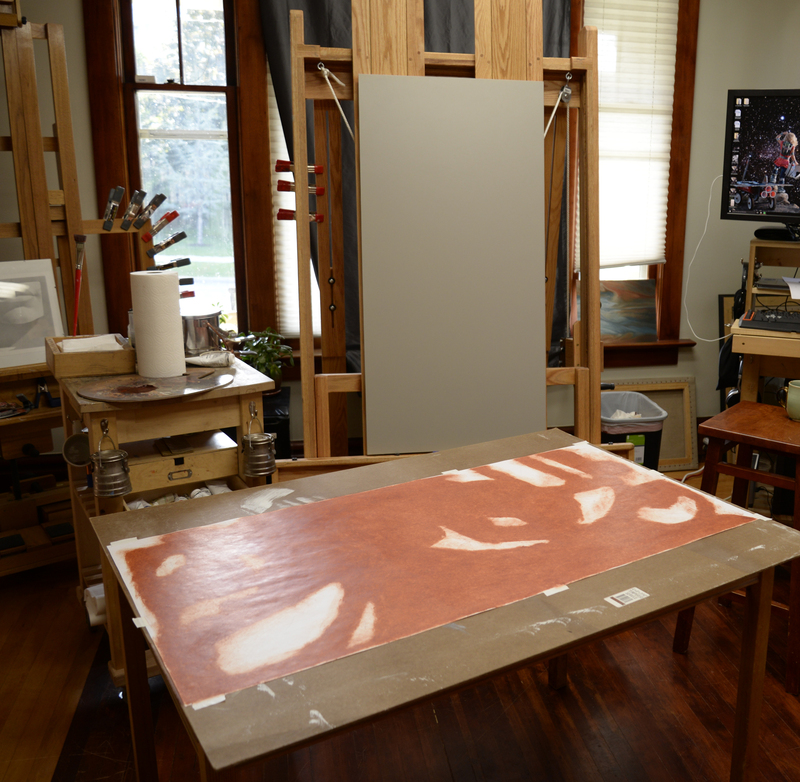 In this case, I had a prepared 24 x 48 inch aluminum composite panel waiting on the easel. A little simple math tells me that this means the drawing will have to be blown up 169%. ((48/(72/2.54)) x 100) Any copy shop should be able to handle this job. I usually get two or three copies in case I screw the transfer up the first time (although that hasn’t happened yet). Bonus: my kids get to color the leftover copies! Free babysitting! It takes hours to color a 24 x 48 inch picture with crayons! Next, I lay the copied drawing face down on a smooth surface, and secure it with a few pieces of artist’s tape so I don’t have to worry about chasing it around while I’m applying the paint. 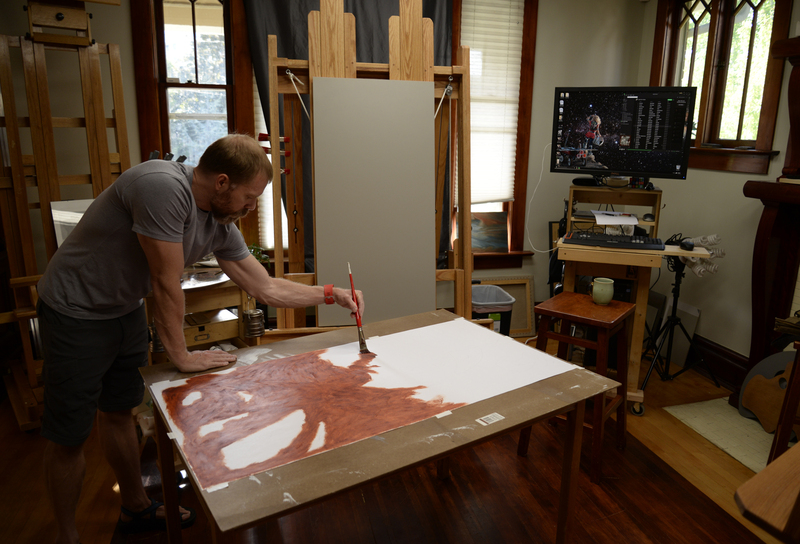 These days I prefer to use Burnt Sienna. It dries quickly, and it’s a semi-transparent and relatively weak pigment that won’t bleed through the subsequent layers of paint. And it’s a lovely color! (It’s cheap too. Wouldn’t want to be doing transfers with Cobalt Blue or Cadmium Red.) In some cases (this was one), I am transferring a drawing that has a lot of open space with no lines that need to be transferred. 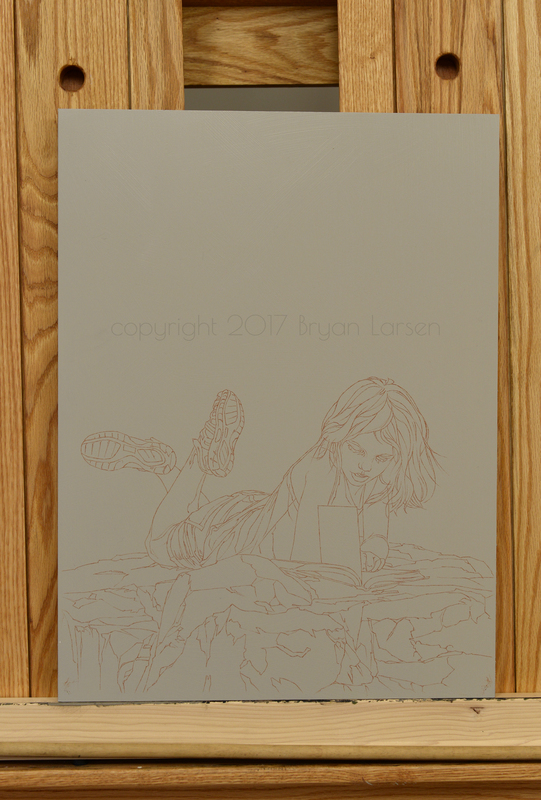 I held the drawing up against a window and traced out some guide lines around the blank spaces so I wouldn’t waste time and paint covering those areas with a layer of oil. The next step is simple, but absolutely key to getting a clean transfer…and one I learned the hard way. Once the paint is applied in as thin a layer as possible, grab a roll of paper towels and rub off as much paint as you can without tearing the paper. There will be plenty of pigment left absorbed into the paper to accomplish the transfer. Seriously. 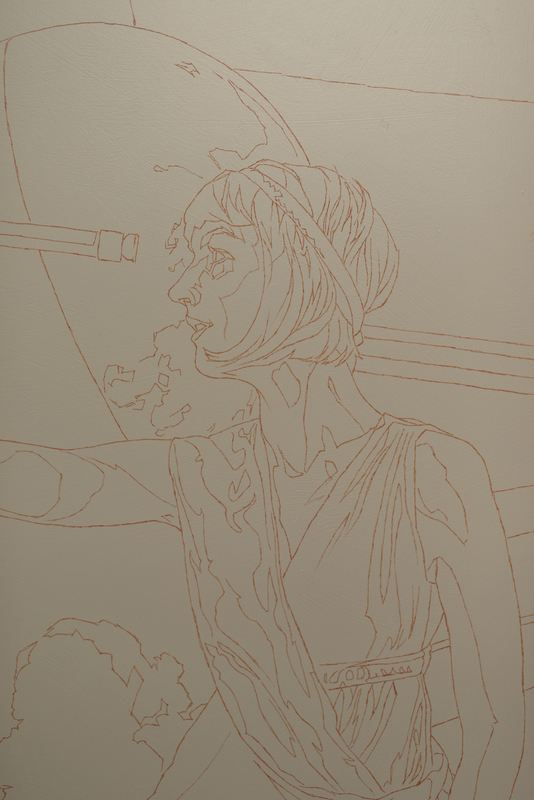 Next, secure the drawing over the canvas or panel. I use artist’s tape. 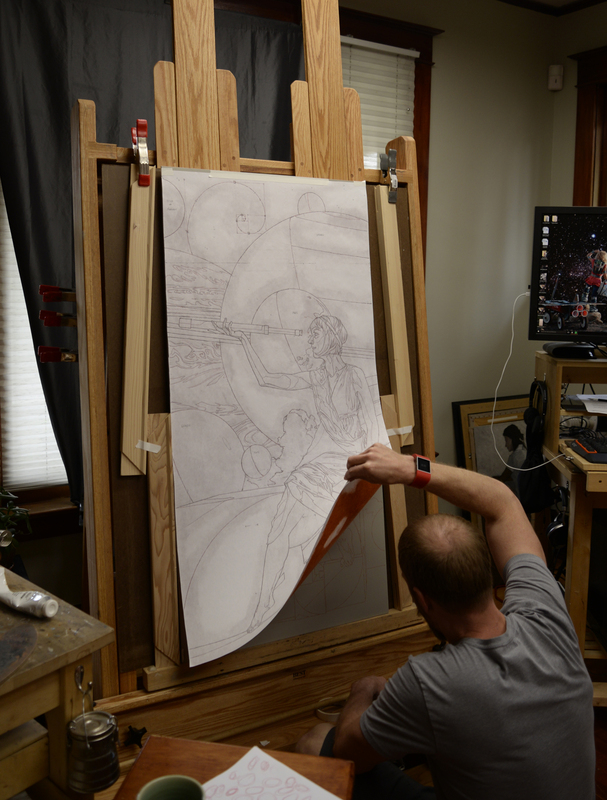 A lot at the top, so I can peek under the drawing from time to time to check the progress of my transfer, and a couple of pieces around the perimeter to keep the drawing from shifting as I work. Next Step? Just trace over any lines you want transferred. I use a red ballpoint pen. The ball point rolls smoothly over the drawing without tearing through, even if I press hard (which you don’t have to), and the red ink allows me to easily differentiate between the areas I’ve already traces and the ones I haven’t. I use a mahl stick to keep my hand from pressing down on the drawing and transferring oil paint anywhere I don’t want it. You can skip this if you are a robot or have uncannily steady hands. Check to make sure everything transferred over BEFORE you remove the drawing! You’ll never get it lined up in exactly the same place. Again, disregard if you are a robot. And that’s it! 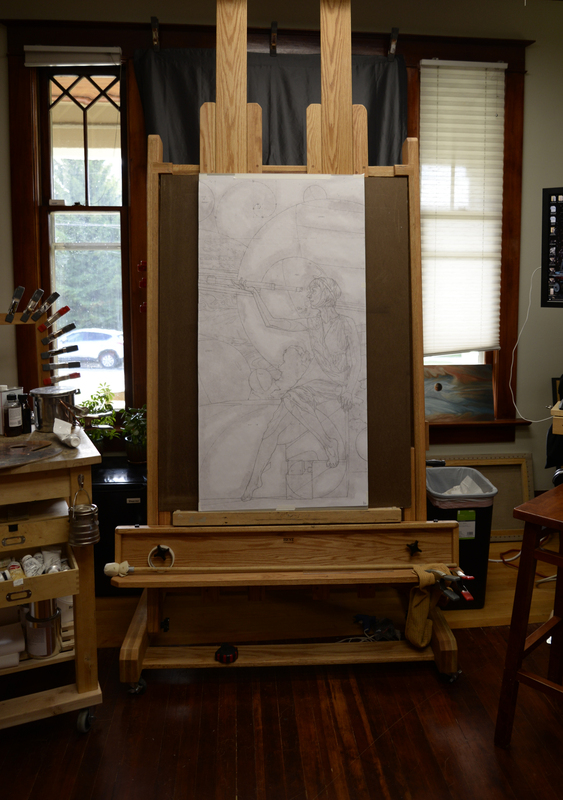 Your drawing should now be cleanly transferred over to your canvas or panel in a lovely layer of pure oil color. 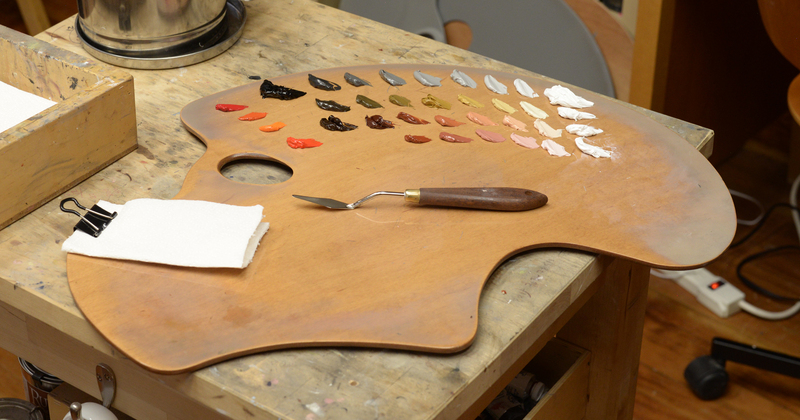 If you used Burnt Sienna, Burnt Umber, Raw Umber or another rapidly drying earth tone, the transfer should be dry to the touch and ready for paint in 8-12 hours. I’ll give this a try! Thank you so much!!!! It is so great way and I appreciate it a lot you share your technique!! THANK YOU! Thank you for sharing your techniques so generously. I’ll remember this one. 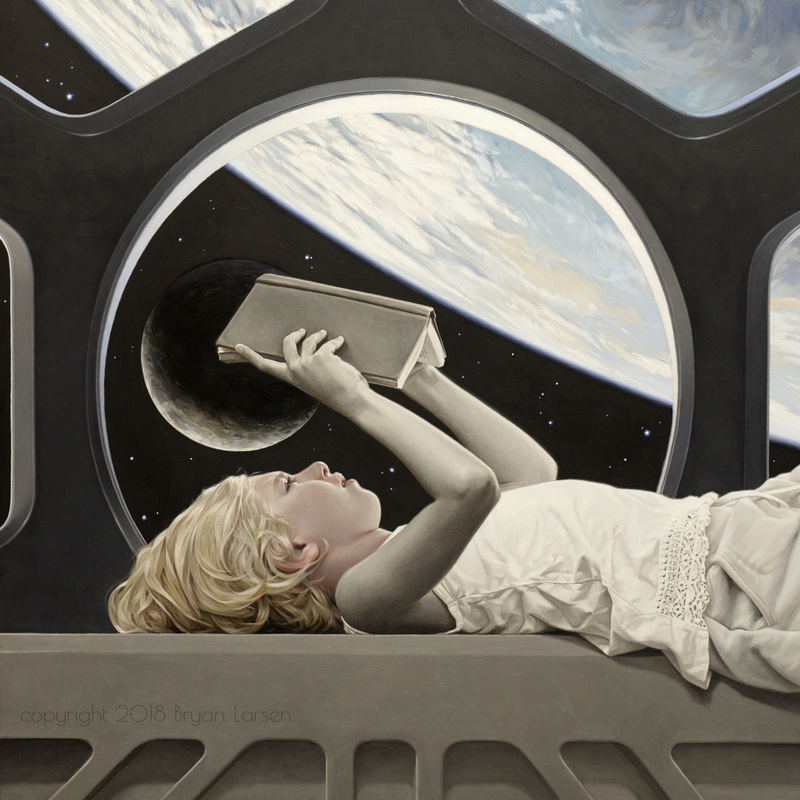 I love the new website and I adore “I’ll Be Outside” and your first space cat! Thanks, Jeannie! Space cat was a blast to paint. I predict more of that sort of thing to come. thanks so much for sharing your process! Your work is wonderful, so much fun to look at! I was going to try transfer with water color on my egg tempra toned surface. The glossy surface does not take charcoal well. Then coming across your talk with Danny Grant led me to your website, knowing you use oil transfer is so reassuring. Just wonderful to have found your website. My pleasure! Let me know if it works! 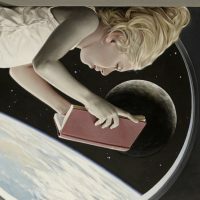 I just recently found your work, and I must say, it’s amazing and very inspirational work! I have a question about the oil transfer method if you have time. 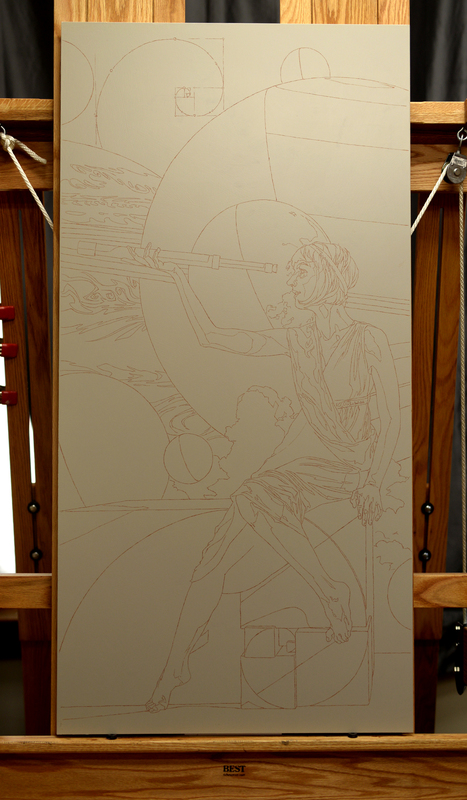 I’m getting ready to work on a rather large panel (it’s 48” x 72”) and I’m wanting to give this transfer method a try. I’m going to use Raw Umber and was wondering if you knew a good brand that dries very slowly, slower than 12 hours? Thanks again for sharing your knowledge and being so open about your process! I don’t know of a slower drying Raw Umber. My suggestion, if you think the transfer will take longer than one sitting, is to do it in sections. I have done this several times with good success, including on the large ‘Triumph of Daedalus’ paitning I just completed hich was 120×60 inches. That drawgin was transferred in 4 quadrants over two days. 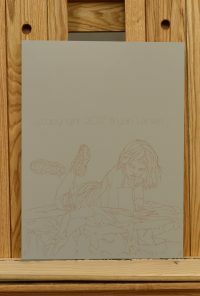 I arranges the four sections of the drawing on the panel before hand and made registration marks on the panel that I could line up with the separate sections when I secured them in place to do the transfer. Thanks Bryan, the transfer in sections definitely seems the way to go. Can’t wait to see more work of yours! Let me know how it goes. Happy painting! This explanation is fantastic. Thanks for being so clear! I’m off to do me some o’ dat oil tranferrance. Wish me luck!